The problem is nonlinear. An incrementally iterative scheme for solution is mandatory. Prescribed displacements are applied in small increments and an iteration has to be performed for equilibrium in each step. Furthermore the problem comes out to have a rough characteristic or rough solution (solution -> vector of nodal displacements). Rough is the contradiction to smooth. Changes in the solution from step to step are not smooth but somehow abrupt and oscillatory within some bandwidth. This is due to cracking which abruptly changes a system’s characteristics. 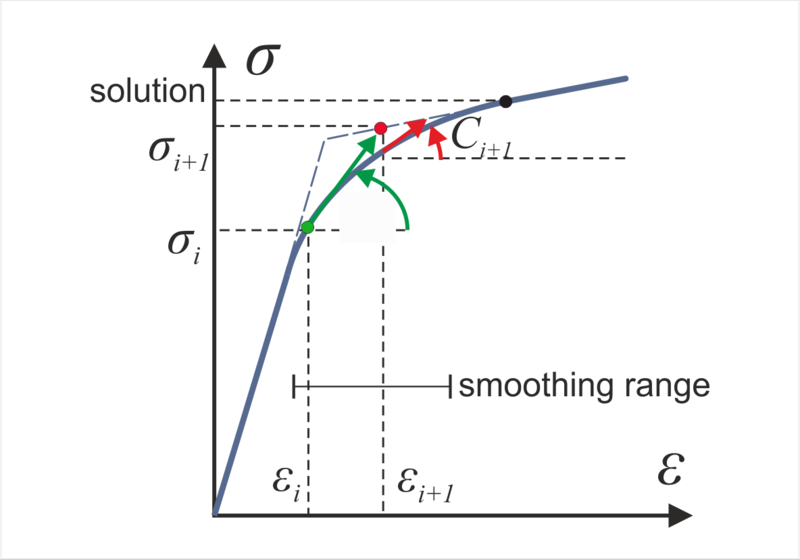 The Newton-Raphson method or the modified Newton-Raphson-method generally will not lead to convergence within a loading increment, as these methods require sufficient smoothness of the solution. An alternative is given with the BFGS-method (Bathe 1996) which as a quasi-Newton method might yield results for rough problems. It does not operate on local tangential stiffness but more or less builds averages of tangential stiffness. Nevertheless, some issues also have to be regarded for BFGS. Problems may arise with kinks connecting a force or stress variable with a displacement or strain variable. Such may arise with the elastoplastic approach for the reinforcement or the loading-unloading-reloading cycle of a cracked concrete position. Let us start with the elastoplastic issue. Regarding the reinforcement uniaxial relations can be used. We found a solution i with a strain εi+1 which is not yet in equilibrium according to prescribed criteria. 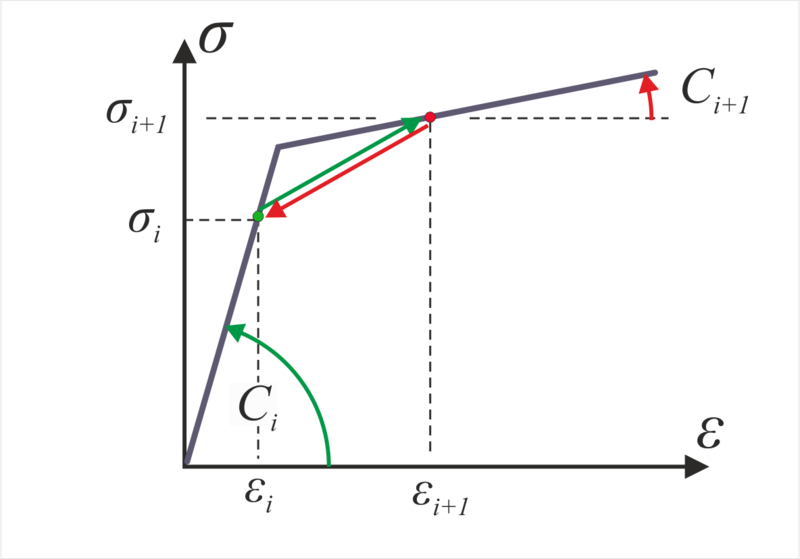 We go on with equilibrium iteration using a tangential stiffness Ci leading to a solution i+1 with a strain εi+1. This is not in equilibrium still. We use tangential stiffness Ci+1 to go on with iteration which leads us back to the former solution εi. This endless cycle without convergence to equilibrium is obviously connected with the large difference in the tangential stiffnesses or the bilinear approach, respectively. I call this effect the “kink effect”. This effect might obviously be avoided by smoothing the kink, see Figure. 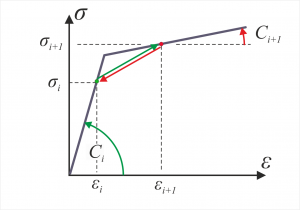 This leads to a gradual change of tangential stiffness allowing for convergence. This approach might work if the increments of loading are not too large. A question remains where to start the smoothing and where to end. Physical behavior of reinforcing steel gives less valuable guidance as the original bilinear approach is an approximation anyway. On one hand the range of smoothing should be small to recover the bilinear course. On the other hand it should be large to facilitate convergence. There seems to be no better solution than trial and error. 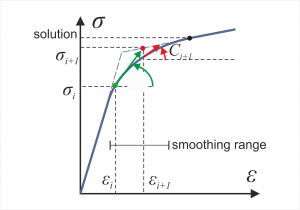 Actually kink smoothing facilitates convergence for the high beam problem if it is applied for the reinforcement component with a smoothing range of roughly 10 % of the yield strain. But the current formulation for plain concrete introduces more kink problems. To be continued, stay tuned.